Home > Article > The Communist Party’s got swag! 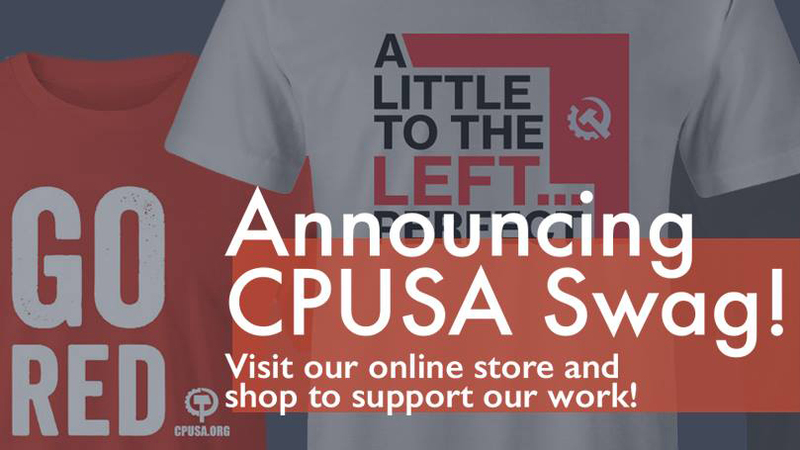 For quite some time now, we have been receiving requests from comrades all over the country who are interested in purchasing CPUSA merchandise. You have been heard – we are excited to announce the launch of our first ever official web store! Our hope for the web store is that it makes our image more accessible to members and allies. By digitalizing our ordering processes, we hope to reduce turnaround time and eliminate snail mail (and the wasted paper that goes with it). As of now, three unique t-shirts are available for purchase. All of the shirts were designed by our members, and each design is union-printed. The shirts themselves are union-made. Proceeds from web store sales go to the Fund For Advancement of Socialism. This fund is used to host Marxist classes around the country for those who are interested in learning more about socialism and creating positive change in our society. Bulk orders are eligible for special pricing. Click here to get your shirt!